Leanne Shapton knows how to make a book. In fact, designing books is what she does. 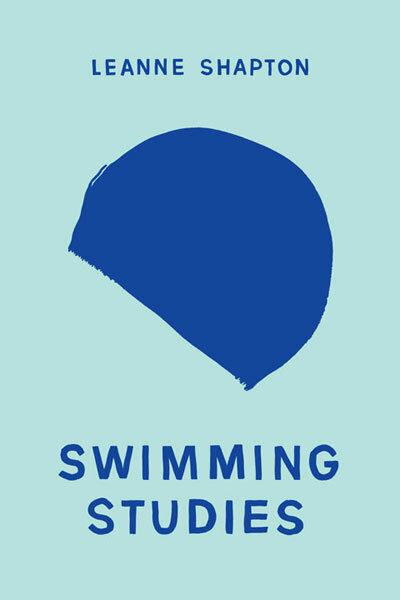 So it’s no surprise that, like Important Artifacts and Personal Property… her latest, Swimming Studies, is a composite of lovely things. Only this one includes essays—mostly memories from her days as a competitive swimmer—complemented by photos and personal art. The essays, however, are almost incidental. But not really. The words are certainly important, essential even, but this is what I mean about how she makes a book: it’s not in any way entirely about the words. In fact, I’d say her best writing is inspired by the visual, also by the remembered: smells, sounds, textures, shapes. And much of this she represents in one visual form or another. This is Shapton at her best—translating the mundane into something that resonates on a large scale, relatable because it’s so real anyone else might overlook it. In no way does she strike me as someone who lives in imaginary places. If the book has a weakness, it’s a tendency to lean toward the sophomoric in a few essays where a stroll down memory lane feels more self-indulgent than relevant or revelatory. I’d like to say this might just be a taste thing, or an age thing, but I’m not so sure. There’s a difference between presenting your life ‘as is’ because you believe it’s fascinating in itself… or really thinking about what it all means and then presenting that in equally simple ways. For instance, in the section ‘Other Swimmers’, a series of portraits with notes, she writers under one: “I am not crazy about Stacy since noticing that she copied onto her own shoes the piano keys I drew on the inside of my sneakers.” It’s not that I don’t get it. She’s bringing us into the minutiae of this world, I get it. I just don’t care. Because it’s the same minutiae of any teenaged world. It lacks that je ne sais what—that deeper point that makes the incident special. It doesn’t help that the entire thing is written in present tense, which gives everything equal intensity and creates pacing that isn’t sustainable. It’s an odd decision, this, and doesn’t suit the subject; not everything about one’s swimming history, however interesting, is that urgent. Overall, not a lot to complain about. Throw in a couple of essays written in past tense, a dash of reflection rather than action, and you’d have the necessary balance missing in this otherwise delicious morsel of a read.